Newcastle City Council is consulting on its pre-submission version of the Development and Allocations Plan (DAP). Once confirmed, the proposed DAP will become part of the Local Plan along with The Core Strategy and Urban Core Plan, which will guide development in Newcastle up to 2030. This is the follow up to the draft DAP which was consulted on in late 2017. SPACE for Gosforth submitted a response to the draft DAP consultation, including comments on Policy DM10 Pedestrian and Cycle Movement and on new policies to protect open spaces. Comments on this final version of the DAP need to be submitted by 16 November 2018. Details of how to do this are on the Council’s website. The website also lists a number of consultation drop-in session at the City Library between 6 October and 10 November, and you can also leave comments at the DAP display stand at Gosforth Shopping Centre. This is the last opportunity to make comments before the DAP is adopted. Following consultation, all comments received will be sent to the planning inspector appointed to consider the DAP at a public examination. The examination will be to find out whether the DAP is ‘sound’ and legally compliant. To be legal the DAP must comply with the conditions set out in the National Planning Policy Framework. The rest of this blog is made up of SPACE for Gosforth’s feedback to the draft DAP in 2017. We hope that this will be relatively self explanatory but if you have questions or observations on the SPACE for Gosforth submission and/or the pre-submission DAP please feel free to post them as a comment. Thank you for the opportunity to comment on the Draft Development and Allocations Plan. The National Planning Policy Framework (NPPF) requires Local Plans to respond to the needs and priorities of the communities covered by those plans. For Newcastle, a relatively compact city with low car ownership but also with illegal levels of air pollution and some of the busiest and most dangerous roads and junctions in the North East, this means addressing those mobility, safety and environmental challenges but also addressing wider challenges related to lower than average health outcomes and poverty. Walkability, and the ability to cycle safely, as well as improving mobility at low cost with minimal environmental impact, also have well documented positive benefitson a range of physical and mental health issues, community cohesion, local economy and environment. Together these address a wide range of economic, social and environmental challenges impacting the people of Newcastle. As such we believe walking and cycling should be considered as a priority across all Newcastle’s Local Plan policies. SPACE for Gosforth is a local residents’ group that seeks to promote healthy, liveable, accessible and safe neighbourhoods where walking and cycling are safe, practical and attractive travel options for residents of all ages and abilities. As such, our main focus in responding is in relation to Transport and Accessibility, Policies, Environmental Protection and Protecting Open Space. This feedback we have set out in Appendix A below. In Appendix B we set out some of the evidence that we have considered in providing this feedback. The Local Plan should not be limited to addressing issues though. It needs to show a city willing to compete internationally, to draw best practice from across the world, from Copenhagen, Amsterdam, Barcelona, Paris, Seville, London and New York, and our twin city Groningen, all of which are investing in the public realm, prioritising sustainable and active travel and investing in (and competing with each other on) liveability and accessibility. If Newcastle is to compete in this arena it needs a strong vision backed by robust policy to deliver that vision. With walking and cycling at the heart of these policies, Newcastle will be able to provide for all its residents young and old, attract families, help people improve their health and access jobs and services. Lowering the cost of travel and improving mobility options so people can access work more easily will help people to realise their full potential and make Newcastle more prosperous. Helping people choose active travel first will make Newcastle more sustainable and differentiate it from other UK cities. We look forward to discussing these policies with you further and would welcome the opportunity to meet once you have had the opportunity to consider consultation feedback. Position The DAP Policies should prioritise mixed-use development to minimise the need to travel which in turn will minimise the development’s impact on the surrounding road network and the local environment including air quality. On that basis we OBJECT to the current wording. Proposed Changes The Council should review the list of new employment sites along with new housing sites so that where possible developments are mixed use and also have access to other shops and services in the same location. Having separate and distinct zones for employment, retail and housing prevents will mean it is not possible to minimise the need to travel as required by paragraph 5.12 and also policy CS13. Position We wish to propose a specific exemption to this policy for land falling within Employment sites that is currently used for car parking. The policy should be updated to clarify that land used for car parking included within the Employment Sites is not subject to the same restrictions. In these circumstances, any assessment should require that mitigations are in place to avoid parking being displaced onto local residential streets following development. The policy should also allow for applications that seek the partial development of employment sites rather than the site as a whole and encourage mixed-use developments subject to meeting other Local Plan policies. Evidence & Notes The conversion of land used for car parking would not impact the availability of land for employment as the development would be required through policies DM10 and DM11 to ensure alternative travel options are available. Position We feel this policy would benefit from a clarification to ensure it does not conflict with policy DM10 Pedestrian and Cycle Movements, which are key for maximising footfall at Local and District Retail Centres and therefore the economic success of those centres. Proposed Changes We wish to propose the following update building on the currently proposed words. New words are underlined. 1. Maintain and enhance the vitality and viability of the centre. 2. Not dominate or fragment the centre either individually or cumulatively. 3. Maintain an active ground floor frontage. 4. Not divert or unnecessarily interrupt walking or cycling routes. The policy should also allow for the further allocation of additional local retail centres so that they receive the protection afforded by Policy DM4. · Newlands Road, NE2 3NT. · Kenton Park Shopping Centre, NE3 4RU. Evidence & Notes Sub-paragraph 4 is proposed to ensure there is no conflict with Policy DM10. The following map highlights a number of areas in the north of the City, some of which already have a small number of shops, that could benefit from Local Retail Centres sited within walking distance. From a planning perspective it is also worth noting that Local Retail Centres will be better able to thrive if there is sufficient density of housing within a reasonable walking distance. For new residential areas and retail centres this can be planned directly. Existing centres would benefit from improving walking routes and removing severance issues e.g. via new crossings of Metro lines or major roads in line with our proposed updates to policy DM10 below. 1. We would like to confirm that provision for Affordable Housing is included in the housing sites list in Policy DM5. 3. We would like the DAP to include assurances that the only open spaces that will be used for residential development in the Local Plan period are those specifically identified in Policy DM5. 4. More generally, best practice planning for walkable communities requires that development within an area is mixed-use so as to incorporate a range of homes, shops, services and workplaces all within close proximity. This appears to be an approach considered suitable for the Urban Core and for the Newcastle General Hospital site. It is also mentioned specifically in the NPPF paragraph 69 as a way of promoting healthy communities so we are unsure why this same approach is not promoted for the wider city? At Great Park for example, housing development and retail have been divided into separate ‘Cells’. If Newcastle is to make itself a place where people live, work and visit then we need well-linked communities and neighbourhoods, not a form of planning based on separation of inmates in penal institutions. As an illustration of this, if you enter the post-code of Great Park Community Centre (NE13 9BD) into the www.walkscore.com website it states a Walk Score of 9 out of 100, which means ‘Car-Dependent, Almost all errands require a car.’ Gosforth High Street by comparison has a Walk Score of 85. The existing policies that enable the creation of car-dependent suburbs, which make it hard for people to choose other means of travel regardless of how they want to travel, why they are making their journey or where they wish to get to, need to be fixed as part of this Local Plan update. Lower-density development will be permissible only in circumstances where moderate densities would be insensitive to context. Position We support the broad intention of this policy however we feel that, as it stands, it is not sufficiently to achieve the stated objective of sustainable access for all housing, jobs, services and shops nor the wider vision of a prosperous sustainable city. Provide employee changing and shower facilities and secure parking for cycles for major non-residential developments. The Newcastle Core Strategy Policy CS13 section 3(vii) requires that development “provides for direct, safe, secure and continuous pedestrian and cycling links.” Policy DM10 should therefore be updated to also require that routes are direct to support this. NPPF Section 35 requires that developments be designed where practical to “create safe and secure layouts which minimise conflicts between traffic and cyclists or pedestrians, avoiding street clutter and where appropriate establishing home zones.” The NPPF is right to say that danger mostly comes from conflict with vehicles but routes should also be designed to avoid conflict between people walking and cycling. Safety in this context means both from vehicle traffic and also ensuring people feel safe from crime. So, for example, unlit alleyways would not be appropriate. Note that the London Local Plan also includes “comfortable” based on the Cycling Level of Service tool. Section 35 of the NPPF also says where practical to “give priority to pedestrian and cycle movements, and have access to high quality public transport facilities;” Updating the policy to include this priority will help make walking and cycling viable choices for local journeys, where often design is currently an afterthought leading to long circuitous routes and long waits at multi-stage crossings. The Governments’ Cycling and Walking Investment Strategy (CWIS) sets out “the government’s ambition to make cycling and walking a natural choice for shorter journeys, or as part of longer journeys“. Section 1(i) of Core Strategy Policy CS13 requires the council to promote “sustainable travel choices including … improving equality of access to transport for everyone“. We wish to propose this addition as ensuring equality of access to transport is a key part of SPACE for Gosforth’s objectives. As per those objectives ‘everyone’ includes “all ages and abilities.” and “residents or visitors with limited mobility and residents or visitors with disabilities or conditions for whom travel is a challenge.” For examples of how hard it can be to navigate some local streets see the SPACE for Gosforth blogs on Gosforth High Street and the Salters Road junction. Core Strategy Policy CS14 – Wellbeing and Health backs this up by stating “The wellbeing and health of communities will be maintained and improved by … Requiring development to contribute to creating an age friendly, healthy and equitable living environment through: i. Creating an inclusive built and natural environment” and “ii. promoting and facilitating active and healthy lifestyles.” Core Strategy Policy CS15 Place-Making also requires development to create “safe and inclusive environments“. Although a fairly weak statement, NPPF paragraph 35 requires that where practical developments should “consider the needs of people with disabilities by all modes of transport.” Also, one of the objectives of the Government’s Cycling and Walking Infrastructure Strategy (CWIS) is “better integrated routes for those with disabilities or health conditions”. As the purpose of the DAP is to expand on the objectives set out in the Core Strategy we wish to clarify what the minimum set of services that people can walk to should be. 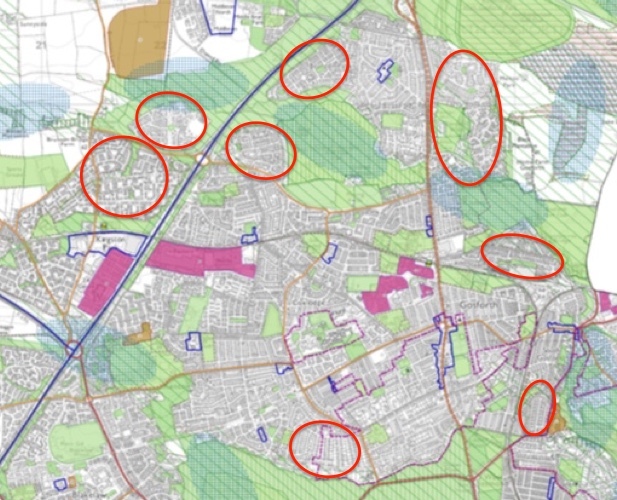 The full list we propose are from the SPACE for Gosforth objective 3: “There is good walking and cycling access to local community destinations including schools, shops, medical centres, work-places and transport hubs.” This should be the minimum for any new development. We wish to propose this new paragraph to include a number of NPPF and Core Strategy objectives to maximise the use of walking and cycling in order to minimise the impact of the development on the wider road network and public health. NPPF paragraph 17 states that one of the core principles for planning is to “actively manage patterns of growth to make the fullest possible use of public transport, walking and cycling, and focus significant development in locations which are or can be made sustainable;” Only by making the fullest possible use of walking and cycling can the wider negative impacts be minimised. Newcastle Core Strategy CS13 section 3(ii) supports this by “Ensuring development … minimises car trips, promotes and enhances public transport and for major development provides sustainable travel plans“. NPPF paragraph 110 states “In preparing plans to meet development needs, the aim should be to minimise pollution and other adverse effects on the local and natural environment.” This is very relevant to transport as it is both a significant contributor to local air pollution and to a number of other adverse effects including noise. Consistent with all the above, the Governments’ Cycling and Walking Investment Strategy (CWIS) sets out “the government’s ambition to make cycling and walking a natural choice for shorter journeys, or as part of longer journeys“. Planning for new developments will be a key part of enabling this to happen. Our proposed change to section 6 is to provide cycle parking (in the same way as we have car parking and not motorist parking). Guidance should also set specific measureable targets for directness, convenience and attractiveness of routes, likely maximum walking distances and any other relevant factors that might assist in ensuring the fullest possible use is made of walking and cycling. Position We support the broad intention of this policy however we feel that, as it stands, it is not sufficiently to achieve the stated objective of making maximum use of public transport. We wish to propose the following update building on the currently proposed words. New words are underlined. 1. Major development must demonstrate that the development makes the fullest possible use of public transport in order to minimise car trips and minimise pollution and other adverse effects on the natural and local environment. 2. Major development will be required to promote and facilitate the use of public transport and demonstrate accessibility by public transport to the Urban Core and other key local facilities. 3. Bus stops should be designed to be accessible for all bus users. 4. Walking routes to public transport stops should be direct, safe and comfortable. 5. Cycle Parking should be provided at public transport stops, located to minimise opportunities for crime. 6. Callerton Parkway, Newcastle Great Park, Kingston Park and Regent Centre are designated on the Policies Map as park and ride facilities. 7. Parking charges should be set to make it cheaper to use park and ride facilities rather than drive further into the City. NPPF paragraph 17 states that one of the core principles for planning is to “actively manage patterns of growth to make the fullest possible use of public transport, walking and cycling, and focus significant development in locations which are or can be made sustainable;” Only by making the fullest possible use of public transport can the wider negative impacts be minimised. To ensure the fullest use is made of the combination of public transport, walking and cycling, routes to public transport should be direct, safe and comfortable with cycle parking provided at public transport stops in a location where passengers are happy to leave their cycle unattended for long periods. Parking charges should be set to ensure the right economic incentives to avoid encouraging people to drive further than is necessary to minimise car use in line with Policy CS13. Position We support the broad intention of this policy however we feel that, as it stands, it is not sufficiently to achieve the stated objective of sustainable access for all housing, jobs, services and shops and creates a potential conflict with the policy to create walking and cycling routes. 1. Provide safe, secure and useable vehicle and cycle parking that satisfies its operational requirements and supports the achievement of policy DM10. Operational requirements for vehicle parking should be calculated to cover only those needs that cannot be met by walking, cycling or public transport. 2. Cycle parking should be placed in convenient locations as close to intended destinations as possible and be easily accessible from the cycle network andshould provide for a range of different types of cycles such as might be used by families or people with disabilities. 3. Provide adequate drop-off and collection, servicing and loading facilities that do not divert or unnecessarily interrupt walking or cycling routes. · Charging points for electric and hybrid vehicles, and for electric cycles. · Ensuring car parking is not displaced to local residential streets outside the development area. · The encouragement of car-free development in areas with good public transport links. Evidence & Notes Well-located secure cycle parking that is usable by different types of cycles is key to making the fullest use of cycling. Position We feel this policy is incomplete in that it only requires development to consider the movement functions of roads. We also wish to propose that Grandstand Road between the Central Motorway and Blue House roundabout is re-designated as a Secondary Distributor Road. Secondary Distributor Roads and Public Transport Distributor Roads should be safe and comfortable to use for people walking or cycling. On these roads the safety of people walking and cycling should be prioritized over parking for motor vehicles. The additional two classifications proposed take account of place function and resolve a conflict between transport and retail/economy in the draft DAP. · Be primarily for the quality of place rather than movement. · Be safe places where people can meet and socialise and children can play without fear of traffic. · Provide the ability to access the residential area for residents, visitors, deliveries and those beginning or ending a journey at any point in the area. · Deter non-residential and through-motor-traffic from entering each area. · Apply a 20mph speed limit on all roads within each area. · Facilitate the safe movement of people walking and cycling through the area and beyond. Residential Area Roads should be the default for all roads not assigned another classification. · Be primarily for the purpose of accessing the retail area rather than movement through it. · Facilitate the safe movement of people walking and cycling to and through the area to access shops and services. All roads included within a District or Local Retail Centre as marked on the DAP Policy map should be designated as Retail Area Roads. Regarding Grandstand Road, it is generally considered good practice that cross-city movements by motor vehicles are made via a ring road i.e. A1 / A19 rather than directly across the city to minimise traffic in residential areas and support air quality objectives. Setting Grandstand Road as a Primary Distributor Road would encourage cross-city motor-traffic. Secondary Distributor Roads and Public Transport Distributor Roads provide the ability for all types of vehicles, cycles and pedestrians to travel within a local area and onwards to neighbouring areas. Vulnerable road users should not be made to feel unsafe or uncomfortable when using those roads. Proposals will need to be made as a matter or urgency to ensure walking and cycling provision is to the required standard on all Primary Distributor Roads as soon as possible. Position We feel this policy is incomplete in that it does not consider public health issues caused by vehicle traffic nor does it adequately address the need to protect vulnerable road users. 1. Development will be required to minimise its impact on the highway network in the interests of safety, efficiency, accessibility and public health, and mitigate any impacts that cannot be avoided. Development should not require changes to the public highway that would reduce safety or comfort for vulnerable road users. 2. Development involving works to the public highway will be required to be undertaken in accordance with the standards of the Highway Authority and ensure that vulnerable road users are appropriately protected during works. 3. Development creating new public highway to be adopted by the Council will be required to be constructed in accordance with the standards of the Highway Authority and the policies set out in the Local Plan including this DAP. Evidence & Notes In 1, additional vehicle traffic as a result of new development has the potential to create a significant negative impact on public health for example through additional road danger, air quality and noise. See for example: http://spaceforgosforth.com/351-2/ These should be explicitly minimised and any remaining impact properly mitigated. In 2, the protection of vulnerable users during highway works is generally poor and should be included to give it appropriate prominence. In 3, aspects relevant to the construction of public highways are included in Local Plan policies and it should be clear that those Local Plan policies should be followed when creating new public highway in addition to any standards specified by the Highways Authority. Position We feel this policy is not currently complete as it gives insufficient weight to the design of the public realm including the layout of individual streets and how those streets connect together, which forms a key part of the design for any major development. 1. Retaining the best buildings, especially those of architectural and historic merit, including assemblages of buildings that create or contribute to coherent and attractive townscape. 2. Taking full advantage of site features and opportunities to improve the character and quality of an area. 3. Integrating development into its setting with regard to the scale and pattern of surrounding buildings and spaces. 4. Enhancing the appearance of the City from major movement corridors. 5. Accommodating an appropriate mix of use to ensure that communities have adequate services, facilities and infrastructure including housing, education, transport and access to employment opportunities within walking distance and to minimise the need to travel. 6. Taking a comprehensive and co-ordinated approach to development. 7. Incorporating hard and soft landscaping including green infrastructure and open spaces as an integral part of design, maximising tree planting, where appropriate, and providing for its long term maintenance. 8. Incorporating measures to address the impacts of climate change and adverse microclimatic conditions. 9. Ensuring buildings are designed to be adaptable for future re-use. 10. Ensuring that the public realm is well designed to foster community cohesion, so adults can meet and socialise, and children of all ages can play safely together on their own street. a. Creating connected, legible, interconnected street layouts with filtered permeability to prioritise walking and cycling. b. Providing safe walking and cycling routes throughout the development with an appropriate level of segregation from motorised transport. c. Ensuring that routes from residential streets to public transport services and wider walking and cycling networks are clear, convenient and direct. d. Ensuring that walking and cycling routes are suitable for people of all ages and abilities and for people with disabilities. 12. Ensuring an adequate level of informal surveillance to minimise fear of crime through the use of outward-facing design. 13. Integrating mechanical plant, refuse and cycle storage into the design of a building. 14. Using high quality and sustainable materials and detailing appropriate to the character of the area. Other changes relate to ensuring a good quality public realm in any new development. CS15 requires development to: create safe and inclusive environments and ensure connectivity and legibility. New paragraphs 10, 11 and 12 above provide detail that will help to achieve these objectives. Position We feel this policy can be improved by better taking account of potential impacts on vulnerable road users. Development will be required to provide a high quality environment and a good standard of amenity for existing and future occupants of land and buildings. Development which would have an adverse impact on the amenity of existing or future occupants of land and buildings will not be allowed. promoting and facilitating active travel through a network of safe routes and avoiding any adverse impact on walking and cycling networks. Evidence & Notes See evidence provided for Policy DM10 – Pedestrian and Cycle Movement. Position We feel this policy does not reflect Policy CS14, which requires that development prevents negative impacts from air pollution, nor NPPF paragraph 110, which states that Local Plans should aim to minimise air pollution. It also does not address exposure to existing poor air quality nor the impact on the local or natural environment as required by NPPF paragraph 110.
it would not place existing or future occupants, users or members of the publicat risk from hazardous installations. It helps to achieve local and national targets to reduce greenhouse gas emissions. Non-compliance with this policy cannot be offset by other benefits that might be achieved by approving the development. One of the Core Planning Principles of the NPPF (paragraph 17) is to “contribute to conserving and enhancing the natural environment and reducing pollution. ”Paragraph 110 of the NPPF states “In preparing plans to meet development needs, the aim should be to minimise pollution and other adverse effects on the local and natural environment.“Newcastle City Council Policy CS14 states “The wellbeing and health of communities will be maintained and improved by: … Preventing negative impacts on residential amenity and wider public safety from noise, ground instability, ground and water contamination, vibration and air quality,”New sub-paragraphs 2 and 3 above are based on (b) and (a) from Policy 7.14 of the London Local Plan.The London Local Plan for Policy 7.14 Improving Air Quality includes the following:B Development proposals should:a) minimise increased exposure to existing poor air quality and make provision to address local problems of air quality (particularly within Air Quality Management Areas (AQMAs) and where development is likely to be used by large numbers of those particularly vulnerable to poor air quality, such as children or older people) such as by design solutions, buffer zones or steps to promote greater use of sustainable transport modes through travel plans (see Policy 6.3)b) promote sustainable design and construction to reduce emissions from the demolition and construction of buildings following the best practice guidance in the GLA and London Councils’ ‘The control of dust and emissions from construction and demolition’c) be at least ‘air quality neutral’ and not lead to further deterioration of existing poor air quality (such as areas designated as Air Quality Management Areas (AQMAs)).d) ensure that where provision needs to be made to reduce emissions from a development, this is usually made on-site. Where it can be demonstrated that on-site provision is impractical or inappropriate, and that it is possible to put in place measures having clearly demonstrated equivalent air quality benefits, planning obligations or planning conditions should be used as appropriate to ensure this, whether on a scheme by scheme basis or through joint area-based approachese) where the development requires a detailed air quality assessment and biomass boilers are included, the assessment should forecast pollutant concentrations. Permission should only be granted if no adverse air quality impacts from the biomass boiler are identifiedSee: https://www.london.gov.uk/what-we-do/planning/london-plan/current-london-plan/london-plan-chapter-seven-londons-living-spac-16The final addition is to clarify that this policy takes precedence over other policies and that, for the benefit of public health, all developments must be compliant with this policy with no exceptions. Such an approach is consistent with that set out in NPPF paragraph 14. Position We feel this policy would benefit by the addition of the clarifications proposed below. ii. the benefits provided by that alternative provision would outweigh any harm. viii. Include walking and cycling routes where possible. 3) Contributing to off-site provision where on-site provision of green infrastructure is not possible. 4) Addressing gaps in the Strategic Green Infrastructure Network corridors and providing improvements within the Opportunity Areas as identified on the Policies Map. The change to (2) reflects paragraph 6.12.5 of the draft DAP and is to highlight the importance of providing walking and cycling routes in line with new Policy DM10 including changes as proposed above. Position We feel this policy does not fully recognise the benefits of street trees that support the vision of sustainable cities, distinctive places where people want to live, work and visit and enjoy high quality lifestyles. II. appropriate mitigation and enhancement measures are provided including replacement planting in line with the relevant SPG. In this report it recommends implementing planting standards such as 4 trees per new dwelling or 2 trees per 100 sq.m. commercial floorspace, and that developer contribution payments should be structured so it is economically beneficial for developers to retain mature trees rather than plant new ones. Such standards should be to establish Newcastle upon Tyne as one of the UK’s most sustainable cities and included either in the DAP on in Supplementary Planning Guidance. We do not feel the policy will contribute to making “Newcastle a great place to live, work and enjoy”, nor ”providing the right development in the right places at the right time.” Quote from p3 Forward of the DAP. There appears to be no benefit to allocating of some of Newcastle’s Parks as surplus and therefore suitable for development at the same time as proposing a Parks Charitable Trust to protect Parks from future development. We propose that the current policy is revised completely on the following basis and then resent for public consultation in its new form. 1. Parks proposed to be transferred to the new Parks Charitable Trust should be named as being protected in the DAP just as they are currently in the Unitary Development Plan. The assessments carried out as part of the Parks Charitable Trust should be sufficient to justify that none of these parks are “surplus”. 2. Ratios for amenity green space should be set to recognise the significant value of green space and to ensure that availability of green space differentiates Newcastle from other cities so that, as set out in the Vision 2030 it is a place where people choose to live, work and visit, and where people can enjoy a high quality lifestyle. 3. Distances to green space should be calculated using a realistic walking speed that allows everyone access to parks and green spaces, not just those who are fit and able. For example, guidance for pedestrian crossings suggest that older people are more likely to walk at 1.8mph than 3mph as has currently been used. 4. Assessment of walking distances to green space should take account of natural and man-made barriers such as Metro lines that make walking distances longer than if it were possible to walk directly, and also of any barriers that make access more difficult for people with disabilities such as footbridges with steep steps. 5. Serious consideration should be included as to whether older children can access green space independently or whether there are specific issues with road safety that might prevent them even if within a target distance. 6. Where it is judged that there is insufficient green space (parks or amenity green space), specific locations should be identified on the Policy Map where additional green space can be created to make up for that shortfall. 7. Consideration of whether there is surplus Amenity Green Space should be based both on an assessment of that category alone but also in combination with land allocated to Parks. So for example in Kenton Ward where based on current policy there is a significant surplus of Amenity Green Space this would be protected as there are no Parks in that ward. 8. That assessment should also be based on whether there are other suitable local sites where development could take place in preference to using Amenity Green Space, and the potential impact on demand for green space as a result of other potential future development in the area. This is similar to paragraph 1 (ii) in policy DM2 – Protection of Employment Sites. The assessment should also require evidence that the site has not been used and that efforts have been made to encourage its use, similar to policy DM2 paragraphs 1(i) and 1(iii). 9. Where there is still surplus Amenity Green Space under these new guidelines specific consideration should be given as to which specific green spaces are most likely to be impacted and which should be retained. The latter should be named specifically. 10. The policy should specifically set out the uses that surplus Amenity Green Space can and cannot be used for. It is appropriate that this is considered as a matter of policy and guidance is provided to planning officers as to how they should judge the benefits of potential schemes against the harm caused as a result of losing Amenity Green Space. Position We feel this policy can be improved through the additional requirements for accessibility. 1) Residential development will be required to contribute to the provision of new open space, enhancements to existing open space and maintenance to meet the Council’s open space quantity, quality and access standards. viii. include a suitable long-term management and maintenance programme. 3) Communal food growing opportunities within major residential developments will be encouraged. The usability of open space depends on the ability of the public to be able to access those spaces, in particular older children who with to travel independently. Thresholds for provision should be reviewed to ensure that there is no benefit for developers to submit multiple smaller applications compared to one single large one covering a whole site. Appendix B. How have we reviewed the Draft Development and Allocations Plan? 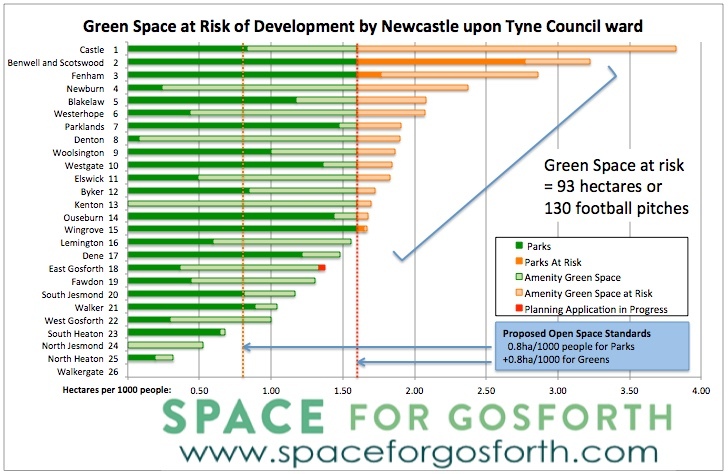 SPACE for Gosforth has evaluated policies against SPACE for Gosforth’s objectives and against further Newcastle City Council policy and commitments as they relate to the SPACE for Gosforth objectives. SPACE for Gosforth objectives Does the draft DAP support the SPACE for Gosforth objectives? Walking and cycling are safe, practical and attractive travel options for residents of all ages and abilities. Streets are easier and safer to navigate for residents or visitors with limited mobility and for residents or visitors with disabilities or conditions for whom travel is a challenge. There is good walking and cycling access to local community destinations including schools, shops, medical centres, workplaces and transport hubs. Streets are valued as places where people live, meet and socialise, and not just for travelling through. The negative consequences of excessive vehicle traffic including injury and illness from road traffic collisions, air pollution, community severance, noise pollution and delays are minimised. Air Quality Does the draft DAP support the Council to meet Air Quality targets in the shortest possible timescales as required by the Government and by High Court judgements? Newcastle Core Strategy Vision Does the draft DAP support the Core Strategy Vision? · Make Newcastle one of the greenest cities in Europe? · Ensure that the health and wellbeing of Newcastle’s residents is considered in all policies so that everything about the way the city works promotes good health and wellbeing? · Meet the needs of Newcastle’s residents whatever their age – young and old? · Reduce inequality and advancing equality? · Put children’s rights at the heart of the city and support all children to grow up healthy, safe and resilient? Parks Trust Charitable Objectives Does the DAP provide protection for green space consistent with the proposed Park Charitable Trust objectives? · Provide a practical framework within which decisions on planning applications can be made with a high degree of predictability and efficiency? · Show creativity in finding ways to enhance and improve the places in which people live their lives? · Seek to secure high quality design and a good standard of amenity for all existing and future occupants of land and buildings? · Support the transition to a low carbon future in a changing climate? · Contribute to conserving and enhancing the natural environment and reducing pollution? · Actively manage patterns of growth to make the fullest possible use of public transport, walking and cycling? · Take account of and support local strategies to improve health, social and cultural wellbeing for all? Best Practice So far as is relevant, does the DAP support best practice design for walking and cycling? E.g. Poor Planning means Bigger Junctions? This entry was posted in Planning and tagged council consultation, Planning on October 12, 2018 by SPACE for Gosforth.